TN TRB syllabus 2018 TN TRB Assistant Professor Syllabus 2018 Tamil Nadu Teachers Recruitment Board Assistant Professor Syllabus PDF download TNTRB exam pattern Tamilnadu TRB exam syllabus pdf formate TN TRB exam syllabus for 186 Assistant Professor job vacancy TN TRB Assistant Professor exam pattern. TN TRB Syllabus 2018 – Tamil Nadu Teachers Recruitment Board 186 Assistant Professor exam syllabus download link has been activated. TN TRB exam pattern also available to download. Tamil Nadu Teachers recruitment board has been released the notification for 186 law Professor vacancies. The interested and eligible candidates can able to the recruitment syllabus from here. The candidates are requested to download the exam syllabus to prepare for the examination. It is the heart of exam preparation. This is will be very much helpful to prepare for your studies. Generally studying with syllabus is a brilliant idea to get succeed in the examination. 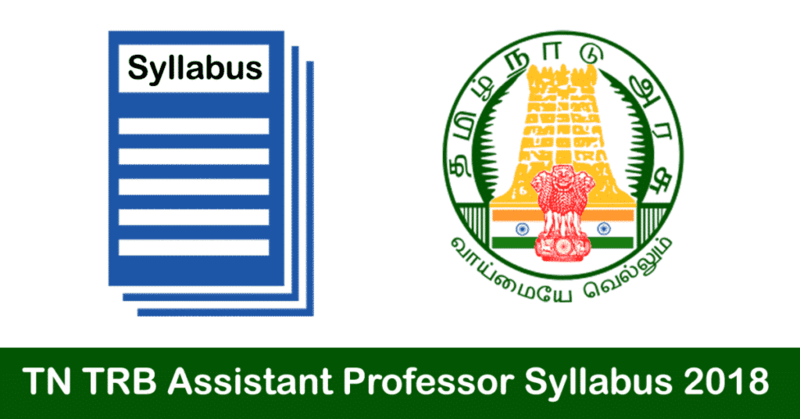 TN TRB Assistant Professor Syllabus 2018 – Tamilnadu TRB Law assistant professor syllabus is available to download. Most of the job seekers failed to follow the exam pattern and question paper structure. Before going to prepare for the examination, candidates need a clear idea to prepare for the examination. For that need to understand the exam pattern and syllabus first. Here below find a brief review of Tamil Nadu TRB Assistant Professor exam syllabus 2018. Tamilnadu TRB Exam pattern has been given below. This plays a great role while preparing for Assistant Professor examination. The candidates those who are succeeding in the examination, they are using this exam pattern. Usually, TN TRB Assistant Professor recruitment 2018 exam pattern has been released by Tamil Nadu Teachers recruitment board. The written competitive examination will consist of a single paper and the question paper will be of objective type with multiple choice questions. The question paper for all posts/subjects will only be in English. The special OMR answer sheet is provided to the candidates who have to answer the questions, by shading a single answer for each question in Blue or Black Ball-point pen only. The allotment of marks is as follows. Aspirants are requested to follow the TN TRB exam pattern 2018 while preparing for the exam. Kindly share this Tamilnadu TRB Assistant Professor exam syllabus to your friends too. Sir I am completed BA,BEd. ( English) searching for govt job . If any requirements please inform sir.